Today we begin Catholic Schools Week. And we salute our teachers/staff who educate our youngsters for life: excellence in academics and virtue in character. The word of God takes us back to the fifth century before Jesus. The Jews who returned to the ruins of Jerusalem were rebuilding their lives, much like many of our ancestors did in the aftermath of the 1840s Irish potato famine, the 1870s German kulturkampf, or the two World Wars. Ezra gathered people together to renew the covenant God had made with them centuries before—a covenant summed up in a moving phrase: “You are my people; and I am your God.” The people who heard Ezra cried out, “Amen. Amen” -- So be it. They will not only be hearers of God’s word but also doers of that word. St. Paul, in his letter to the Christian community at Corinth in Greece, addressed many problems: squabbles, moral misconduct, personality conflicts, cliques. Paul’s metaphor of the human body describes how different parts—eye, ear, voice, hands, feet—have different functions, yet they all work for the good of the whole body. Paul championed unity within diversity. We are one with God our Father. God abides in us, and we abide in God within a grace-filled community. Concluding, Jesus said, “Today this scripture passage is fulfilled in your hearing.” This was a bold and shocking statement. In a real sense, this was the “inaugural speech” of Jesus, proclaiming freedom from what enslaves us, vision from what blinds us, and healing from what breaks relationships. Jesus then set about giving hope and purpose to those who had found little or no meaning in life. 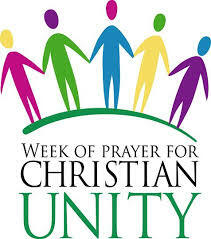 In the week of prayer for Christian unity (January 18-25), we pray that the Spirit will make all of us one, for together we profess that there is only one Lord, one faith, and one baptism. Five hundred years ago, Martin Luther's call for reform spread like a divisive contagion. Until the 20th century, when Angelo Roncalli was elected Pope John XXIII, Catholics, Orthodox and Protestants generally emphasized what divided them. Good Pope John XXIII realized that for people to discuss division, they have to get to know one another. He moved Christians from diatribe to dialog. The 1964 “Decree on Ecumenism” encourages conversations about what unites us, what divides us, and how we can cooperate as a “united”people with common goals. That courageous task remains for us today.